Hey Beauts! After taking a bit of a blogging break I am now officially back. Had a pretty busy summer and autumn, sorting out personal matters... Moving out of my old shoe-box apartment in Hampstead was a big thing. Sometimes it's hard to let go of the old, but then you realise when old goes new comes. Soon after my then boyfriend got on one knee and popped the question. We are now engaged, just in time for Christmas! So it's been very exciting six months of my life. Love does happen in the end, you just got to keep believing in it. And now I am ready to come back to full-time beauty blogging. So I decided what would be a better time to get back into things than Christmas! I picked up this Redken All Soft Gift Set from my Trevor Sorbie salon in good old Hampstead, where I still go to get my hair done. I was just going to get the shamp & condi, but they had these lovely gift sets which also includes a mascara, who can say no to that?! 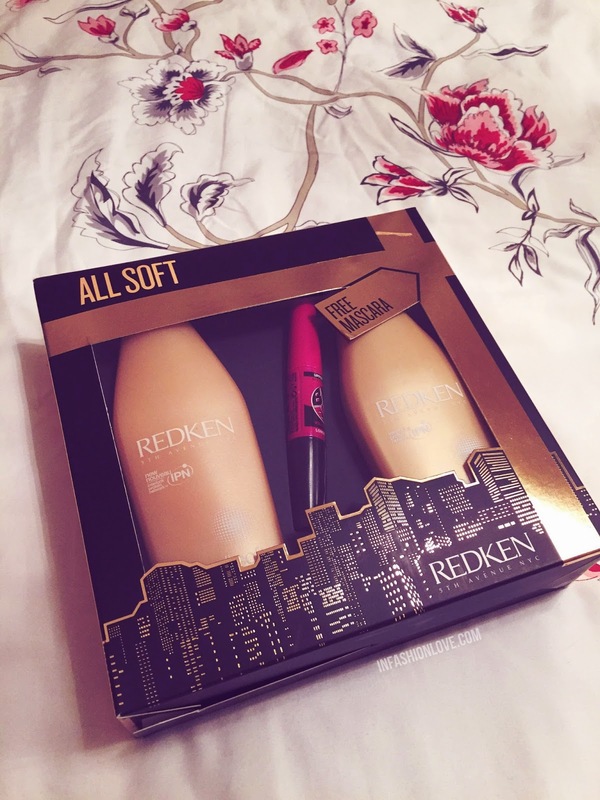 Redken All Soft is my personal favourite range, it makes the hair look beautifully soft and at the same time gives it a nice volume. Not to mention the absolutely divine apricot scent! Gift Guide: L'Occitane Arlesienne Collection!